Enjoy Field Day Facial Tissues. 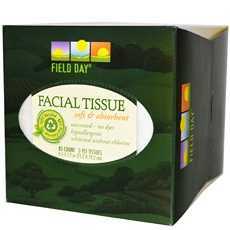 Field Day White Facial Tissues Are Made With You And The Environment In Mind. Our Facial Tissues Are Whitened Without The Use Of Chlorine Bleach, And Are Soft And Absorbent. 100% Recycled, 80% Post-Consumer Content. Hypoallergenic Without Added Dyes Or Fragrance. (Note: Description is informational only. Please refer to ingredients label on product prior to use and address any health questions to your Health Professional prior to use.